Brent is also one of our two opticians. 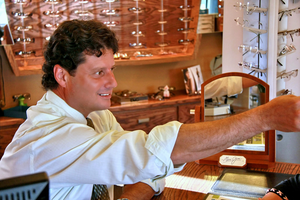 With over 25 years experience as an optician, Brent is capable of performing all specialty tasks such as soldering, lens shape modification, and rimless frame drilling. This allows us to greatly increase the services we offer you in house rather than having to send to outside labs. He is well known to be a very technically skilled optician and is sure to be able to help you with any difficult situation.